Deep purple is a bad color for a weather map. It’s hard to think about this while we’re in the grips of cold and snow, but in the southern hemisphere they’re enjoying their summer. Well, enjoying it everywhere but Australia. While we in North America shiver in the cold, Australians are baking in a record heat wave that makes last July look like a trip to the water park. 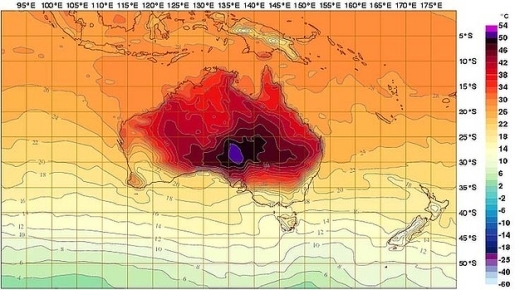 In fact, it’s so hot in Australia that the Bureau of Meteorology has added a new color to the weather map and increased the high temperature to 129 degrees. That’s what that scary deep purple color indicates. Australia has had a staggering five days in a row with temperatures over 102 degrees, which is the first time in the country’s history they’ve had temperatures remain that high. The old high temperature of 50.7 degrees Celsius (123 degrees Fahrenheit has also been shattered thanks to what meteorologists are calling a dome of heat over the country. The first six days of 2013 were all among the 20 hottest on record in the country. Good luck with your shrunken crops, Aussie farmers.